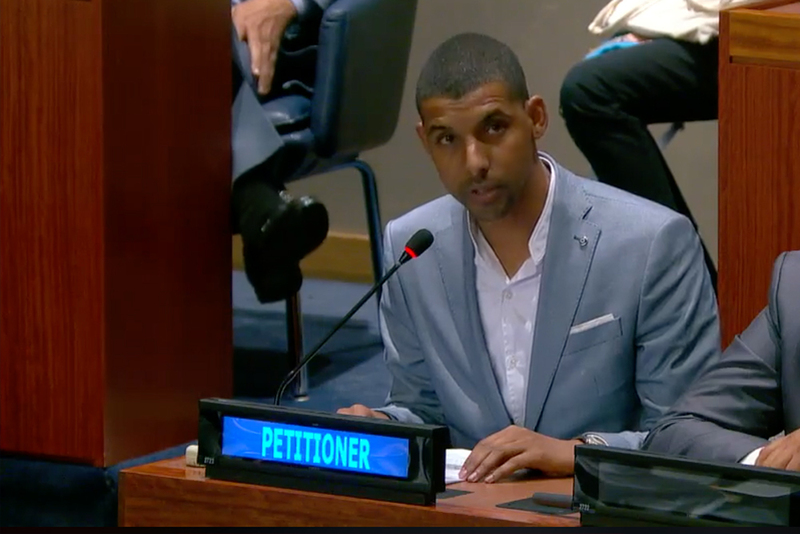 Bouela Lehbib, a second-year graduate student with Eastern Mennonite University’s Center for Justice and Peacebuilding, petitioned the UN Special Political and Decolonization Committee about the occupation of Western Sahara by Morocco. He represented of the Sahrawi Association for Human Rights during an Oct. 11 committee meeting, one of several days devoted to the topic of decolonization. Video footage of the presentation may be available here. Bouela Lehbib, of Western Sahara. The multi-day meeting also included presentations from representatives of Cameroon, Morocco, Algeria, Egypt and the Russian Federation. Lehbib is studying at CJP as a Fulbright Scholar, the first Saharawi to be awarded funding in the program. He completed undergraduate degrees in communication and journalism, and translation, and then was awarded an Erasmus scholarship to earn a master’s degree at Las Palmas University, Algeria. 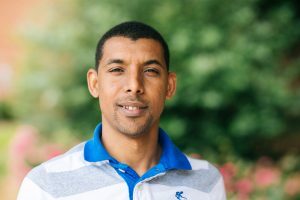 After completing his master’s degree in 2012, he helped establish the first Department of Translation and Interpreting in the Saharawi Ministry for Public Services. He then worked with the international NGO Movement for Peace, Liberty and Disarmament to implement humanitarian projects, such as waste management, food and tents distribution, in the Saharawi refugee camps. His most recent work was for the Danish Refugee Council as a livelihoods team leader. Thank you for this wonderful account of CJP’s international reach. May the positive influence continue to grow stronger and broader.